I wanted a simple mechanism that would allow me to send data to some of my Arduino (http://www.arduino.cc/) projects – I have a scrolling LED matrix display where I want to update the text message without having to hook up a keyboard and I wanted to be able to do this cheaply. Browsing through the web-site of a local electronics store gave me the idea of using infrared (IR) light – I could buy an IR LED and an NPN photo-transistor for a couple of dollars. I didn’t have a complete data sheet for the IR LED, only the information that it emitted light at 840 nm, outside of the range of visible light. You can buy specialized IR receivers that are used in remote controls for televisions and other consumer electronics; these devices only pass through signals that are modulated on a 38.5 kHz carrier wave for purpose of minimizing interference from IR light from indoor lighting and the sun – it is extremely unlikely that a natural source of light would be modulated. Of course to use these specialized receivers, you need to transmit your signal on a 38.5 kHz carrier wave. Unfortunately the electronics store did not stock the specialized IR receivers and I would have to make do with the the simple IR photo-transistor they stocked. My plan was to to connect two Arduinos together using a serial interface but instead of using copper wire to connect the transmit pin of one Arduino to the receive pin of the other, I would use IR light. I designed and prototyped the circuit below one January evening and I was excited to see that my receiving Arduino successfully echoed the “Hello world” message the other Arduino was transmitting. 2. Was my photo-transistor working properly? Could I have inadvertently burned it out? 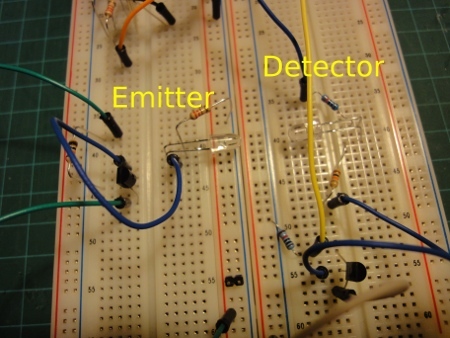 I connected the leads of the photo-transistor to the multimeter and selected the ohm-meter range. 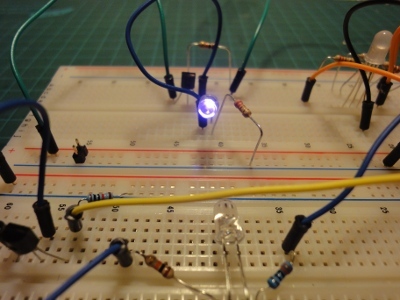 The photo-transistor showed a low resistance, even though I had not pointed the IR LED at it. This was my problem – I had somehow through my careless handling shorted out the photo-transistor. I covered the photo-transistor with my hand and suddenly the multimeter showed infinite resistance – the photo-transistor was working! 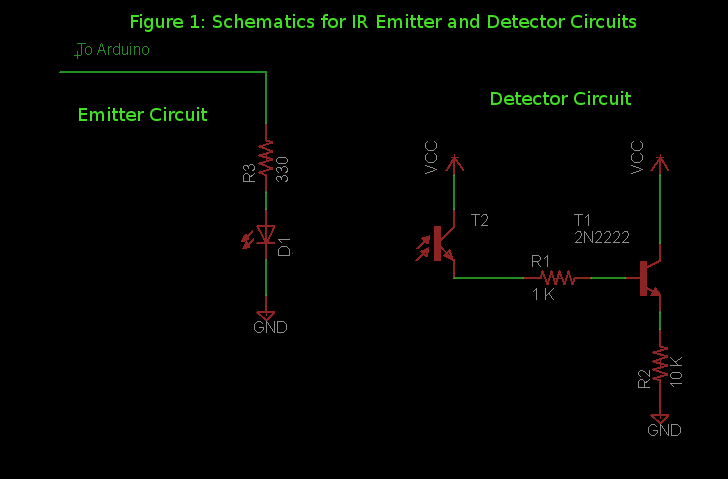 Could I have transcribed the circuit incorrectly in my notebook? For now I am going to use the heat-shrink tubing as my solution to reduce IR interference. Purpose: Reads from one serial port and outputs to another. 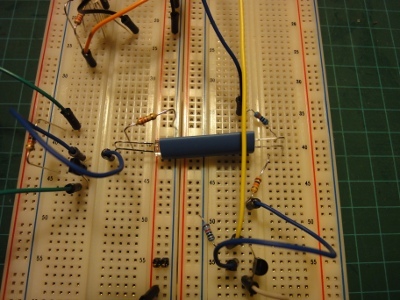 This entry was posted in Arduino and Physical Computing on August 15, 2012 by admin.